Twenty years ago, cruisers were bigger than their riders, and every manufacturer wanted a place at the table. Surely largeness and mercy shall follow us all the days of our lives, and we shall dwell in the house of the Tuning Fork forever. LOS ANGELES, CA January 27, 1999 — Every so often, the staff at MO encounters an e-mail from a reader reciting his wish list of motorcycles. Often the letter is written in the form of a “what if” question. For example, one reader e-mailed us and pondered what would happen if Japanese sportbikes looked as good as Italian sportbikes. He’d buy one, he said. The same question has been asked by many Japanese sportbike owners who said that if Italian sportbikes were built under the same quality control standards as their Japanese competition, they would buy one as well. Manufacturers also ask these questions, although when they do answer it is usually in the form of a new motorcycle. Apparently, a few of Yamaha’s engineers sat around and pondered the universe of heavyweight cruiser motorcycles. What if they could combine the best elements of Japanese and American cruiser motorcycles? They’d most likely create a bike that was elemental in design, one that begged to be customized, possessed strong character and attitude yet was still very reliable and functional and incorporated some of the latest advancements in motorcycle technology, all while produced exacting quality control standards. Hmmmmm … They must have figured they’d sell a lot of them. Yamaha answered this question with the new Road Star, an air-cooled, big-bore, V-twin heavyweight cruiser motorcycle that attempts to combine American character and attitude with Japanese technological advancements and quality control standards. While the Road Star is not a revolutionary motorcycle, the Road Star Project does represent an evolution in how Japanese manufacturers plan to grab more of the North American cruiser market. For a while the Japanese seemed to design cruiser motorcycles the same way they designed their cars — function before form. What most Americans need from their automobiles is functionality and reliability, and the Japanese automakers provide a combination of value and quality that has Detroit often playing catch up.underThe Road Star is a manly bike, looking at home in this manly dock side setting …Japanese motorcycle manufacturers seemed to approach the North American motorcycle market the same way, offering a good combination of value and reliability with styling nods that attempted to satisfy the traditional American enthusiast. But in North America motorcycles are not necessities, they are adult toys and fashion accessories and emotion is the most important factor (except for, of course, disposable income) in the purchase decision. Many Japanese cruisers take styling cues from America, but the engineering is decidedly Asian. The Road Star, on the other hand, might be the first Japanese heavyweight cruiser designed with an understanding of what traditional American enthusiasts want in a motorcycle, with both styling and engineering cues taken from Uncle Sam. The centerpiece of the Road Star is the new, 98 cubic inch (1602 cc), 48° twin-cam pushrod engine. Yes, you’ve heard correctly, it’s a pushrod engine produced by a Japanese manufacturer. Yamaha explained that they wanted to design an engine that produced tons of low-end torque and allowed for short shifting. Because their design goals called for an under-square bore and stroke — 95mm x 113mm — a pushrod design allowed them to meet their goals without making the engine too tall physically. 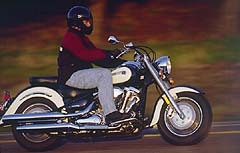 In fact, Yamaha claims that the Road Star has the lowest engine height of any V-twin cruiser in its class. … Yet it is also flexible and expressive, here posing with the epic Northern California coast as a backdrop. 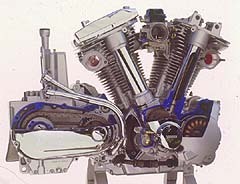 A view of Yamaha’s big twin (1602 cc), the biggest production twin made. While a pushrod engine is not exactly cutting edge, the Yamaha’s twin-plug, four-valve per cylinder big twin (Harleys have two-valves per cylinder) is far from agricultural, offering technology such as forged lightweight pistons and ceramic composite cylinder sleeves. 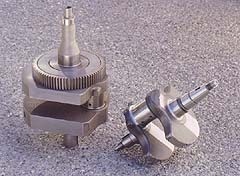 The crankshaft is huge, the inertial mass is more than twice that of the Royal Star. With such a heavy crankshaft, the Road Star is geared to cruise at 65 mph at about 2400 rpm and produce around 90 ft-lbs of torque at the crank, making the Road Star one of the torquiest motorcycles around. The Road Star is the first belt-driven motorcycle ever produced by Yamaha. The engine is solid mounted but it feels smoother than solid-mounted Harleys. Vibration at all speeds was much less than we expected for a rigid-mounted, big-twin engine. The engine note at high speeds was a little high and soft, but at lower speeds the Road Star emitted a melodious, bass, pulsing growl that was authoritative but not too painful to the ear. 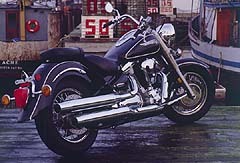 With an aftermarket muffler, the Road Star should emit a more resonant note all across the powerband. The Road Star handles well. Of course, it feels like a heavyweight cruiser, particularly in town, but it carries its weight well, and we never felt overwhelmed. With its prodigious torque, we loved how smoothly it pulled out of corners. The Road Star will take off with very little throttle input. While it possesses only three degrees more ground clearance than the Royal Star, those three degrees are noticed, although in tight turns at higher speeds we easily dragged floorboards. Rider ergonomics are comfortable, the floorboards, the bar/floorboard position and low seat height are just right for the long, low riding attitude Yamaha is trying to emulate. We could do without the stock seat, however. It’s too soft and it was the only blemish on an otherwise very comfortable motorcycle. The overall build quality looks excellent. The instrument panel, attached to the fuel tank, offers all the standard warning lights along with a fuel gauge, low-fuel light, twin trip odometer and digital clock. The brakes are good, in particular the rear brake, which is strong. The Road Star shifts well. The clutch is grabby but this is more than compensated by a smooth motor.With its elemental design the Road Star begs for customization. 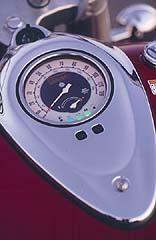 Easy customization was intended by Yamaha, and they alone promise to offer more than 160 Road Star accessories. The belt drive, steel fenders and right side dual exhaust allow the Road Star to easily tap into the aftermarket. Yamaha also will provide a casual touring version of the Road Star, the Silverado, which includes saddle bags, studded seat and backrest, an adjustable windshield and whitewall tires. Lose the stock seat and you have a very comfortable cruising mount. At $10,499, one of the best things going for the Road Star is the price. 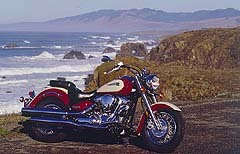 We have already received an e-mail from a reader who said he chose a Road Star over an American cruiser because of its availability and price. Don’t misread us, we are not saying that the Road Star will steal market share or riders away from American manufacturers. But we do feel that Yamaha has positioned itself well to tap into a growing, specific enthusiast base heretofore monopolized by American manufacturers. More competition means better motorcycles. Kudos to Yamaha for applying some pressure.